This year, Lent follows more quickly upon our Christmas rejoicing, when we last wrote you. Therefore, let us hasten to take on, with grateful hearts, the spirit of our Redeemer, born for us that He might lovingly offer Himself to die upon the Cross for our sins. Lent, by its fasting and other penitential works, allows us to unite ourselves closely with the redeeming work of Our Lord. Our Lord gives careful instructions (Matthew 6:1-18) regarding prayer, fasting and giving of alms, the customary practices during Lent. These works, in order to be good, holy works and to have any value at all, must be done with a pure intention for God alone – before His Face, in His presence, for His purposes. In a word, they must come from the heart and have God and union with Him as goal. Abbot Guéranger mentions another Lenten practice to the faithful: “There is one means more whereby we are to secure to ourselves the great graces of Lent; it is the spirit of retirement and separation from the world. Our ordinary life, such as it is during the rest of the year, should all be made to pay tribute to the holy season of penance.” He goes on to suggest the giving up of the worldly amusements that often clutter the days and nights of so many people – going out on the town; spending needless and inordinate amounts of time on the Internet and watching television, sports and movies; preoccupation with avoidable and really nonessential projects that are nothing more than busywork, etc. Unless necessity obliges, stay home and learn to love solitude and simpler, quieter hours. This sort of “seclusion” offers a practical way of accomplishing our good works “in secret,” as Our Lord refers to it in the gospel passage referred to above. And silence has a way of challenging and penetrating our souls as no other means. 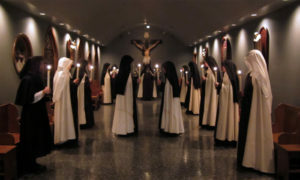 Some of you reading this little epistle about Lent may be thinking that this more solitary life is just for monks and nuns in a cloistered monastery. And perhaps many feel a bit of irritation at the start of Lent at “having their wings clipped.” But your own Master and Lord urges it to all, by His example and by His words: “And rising up long before daybreak, He went out and departed into a desert place, and there He prayed.” (Mark 1:35) “Come apart into a desert place and rest a while.” (Mark 6:31) Note that it is an invitation to be in solitude with Him; He forces no one. However, the directive to penance is indeed a command… Since we are sinners, we must do penance; since we want to be like our Master who has gone before us, we must do penance. But let us do it generously with peace and joy, not with bitterness or resentment. A grand outcome is the expected goal: the transformation of our souls, so that we are able to share more intimately in the glory of Our Lord’s victorious Resurrection. We invite you to read more about Lent in the Doctrine and Devotions portion of our website. We have collected (and will continue to add) there what much holier people have written and preached to instruct souls about this sacred season. Plenty of food for reflection! St. Andrew Corsini, a more well-known Carmelite saint (Feast day Feb. 4th), exemplifies the path and the goal of Lent – since he was a sinner like the rest of us. Very briefly, he was born in Florence on November 30, 1302, a member of the powerful Corsini family. Wild in his youth, Andrew was converted to a holy life by his mother, who labored to make him know that he was, before his birth, dedicated to God through the Holy Virgin Mary. His conversion made him examine his conscience and realize the superficiality and uselessness of the life he was leading. And so, from a sinful life, he was led to eminent sanctity by divine grace. He entered the Carmelite Order, studied in France and then returned to his birthplace. There he became known as the Apostle of Florence and was called a prophet and miracle worker. Named in 1349 as the bishop of Fiesole, a province of Florence in the Italian region of Tuscany, Andrew fled the honor but was forced to accept the office, which he held for twelve years. But he continued as a bishop his hard penitential life, opposed abuses and reformed his own clergy. He was sent by the pope to settle disputes between nobles and commoners, becoming known as a great peacemaker. Andrew died in Fiesole on January 6, 1373. So many miracles took place at his death that Pope Eugenius IV permitted the immediate opening of his cause for canonization. Is it not encouraging to know of one more fellow-sinner who “turned from evil to do good” (Ps. 33), and embracing the Cross of Christ, fought through to gain the victory of Christ? 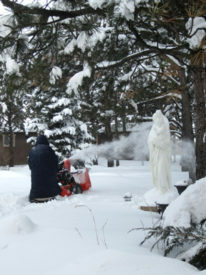 When we offer to readers of our newsletter the opportunity to make suggestions/requests for future letters, one of the more frequent requests is for us to tell about traditional Catholic “practices” – that is, the observances of ordinary life that Catholics keep in order to make life extraordinary – by keeping daily life directed to God and to love of Him. The fasting, alms and prayer that we assiduously practice during Lent is enhanced by many time-honored works and even family rituals, which help to bring souls to the recollection they need to understand what life and Lent are all about. The prayer of the Stations or Way of the Cross is one such ancient Catholic practice. We invite you to learn more about this devotion here on our website: Please also see The Way of the Cross: A Treasury of Stations to learn of different prayerful methods of making the Stations, as well as for an excellent description of the indulgences granted by the Church for the practice of this prayer. There are many requirements for obtaining the indulgences of making the Way of the Cross, but two in particular are important to mention. The first is that one must “travel” or move from station to station, which reminds us that essentially what we are doing is making a pilgrimage, especially a pilgrimage of the heart. We are re-visiting and remembering the moments of Our Lord’s holy Passion, which is why one must also meditate over each station. As the rosary unites us to Christ in all the important mysteries of His life, so the Stations (another Marian devotion), unite us even more particularly to the mysteries of His death. The Stations are usually made in a Church where they have been formally erected, but it is from this same tradition that the Stations Crucifix comes, which is virtually that same pilgrimage in the palm of your hand. The crucifix has small but beautifully rendered depictions of these scenes of Our Lord’s way of the Cross. Using this crucifix, one may keep this valuable devotion privately, still observing the custom of walking, if possible. One of the advantages of this crucifix is that the sick or others who are unable to walk or move may use it profitably. Let us walk in the company of the Blessed Mother, as the early Christians did, as we strive to unite ourselves most intimately to Our Lord in these moments. It was the most important redemptive act in the life of Christ, and thus should be the most important part of our spiritual life. No other devotion enables us more literally to obey Christ’s injunction to take up our cross and follow Him, and this is why so many Christians over the centuries have been attracted to it. Again, Click here to read more about this devotion, and see what the Saints have said about the importance of meditating on the Passion of Christ. For its relevance to Lent, the sacramental we would like to mention this time in our letter is the Pardon Crucifix. Although not much is known of the history of this crucifix, we do know that it originated in France and was first introduced in Rome in 1904. What stands out as unique on this crucifix is the title of the Cross, which spells out the entire title, “Jesus of Nazareth King of the Jews,” rather than the traditional abbreviation (INRI). This reminds us more vividly of Our Lord’s Kingship over us all. On the reverse, we see the Sacred Heart and two inscriptions: “Father forgive them,” and “Behold This Heart which has so loved men.” Our Lord is King, but a merciful King, and His heart is open, ready to receive us. Lastly, at the base of the reverse, an ornate “M” – recalling the steadfast presence of Christ’s Mother at the Cross. The crucifix is well known for the personal love Pope St. Pius X had for it, as well as his remarkable interest in promoting it worldwide. He, the pope who grieved at the inevitability of the coming First World War, was deeply moved at the message and purpose the crucifix championed: mercy, forgiveness, pardon. He granted to its use many indulgences, including the Happy Death Indulgence, a blessing which is usually reserved to wood crucifixes only. There are even indulgences for just carrying the crucifix! Though relatively new (considering the Tradition of the Church), the Pardon Crucifix has become a beloved Sacramental for many Catholics. Over the many years that we have been making rosaries, we find that it is the crucifix most frequently chosen for our custom rosaries, as well as for wearing or carrying. Why is this? Besides its beauty, perhaps it is because this particular sacramental reminds everyone so vividly of that which each one of us so urgently needs, and that which we are often so reluctant to give: forgiveness. “Forgive us our trespasses as we forgive those who trespass against us,” we pray each day in the Our Father. But how often do we pause and realize the meaning of those words? Do we truly mean what we say? Do we truly wish Our Lord to forgive us only as readily as we forgive others? This prayer is set before us once again when we use the Pardon Crucifix, so that with the example of Christ Crucified before our eyes, we may learn to ask pardon for our sins and generously impart forgiveness towards our neighbor. A great many of our books offer direction and guidance to peace during this season of prayer and penance. We want first to mention books that draw the soul close to Christ in His sufferings and to learn and live by His example. Among these especially is a republication of an older book, What Jesus Saw From the Cross. A beautifully moving book, it helps towards meditation on the Passion in a different way: by contemplating the thoughts, reflections and memories Jesus must have had as He looked out onto the scene that surrounded Him on Calvary – its people, its sounds, the city of Jerusalem, His few friends. Father Sertillanges, through biblical and historical studies, has given a work that has become a classic in devotional literature on the Passion. Relics from the Crucifixion is a recently re-issued title, worth reading for its reverent study of the Church’s possession of many of the actual objects of Our Lord’s Passion. “Too easily we skeptical moderns dismiss the authenticity of relics,” says author J. Charles Wall. But highly reliable sources, both historical and scientific, make doubts disappear, to be replaced by awe and veneration. Suffering: The Cross of Christ and its Meaning for You is another book that brings vividly before us the sufferings of Our Lord – and our own with His – through meditation on the Stations of the Cross. This wonderful book gives the Christian Catholic answer to the “Why?” of suffering. Dom Hubert van Zeller gives stirring counsels that hold up before our eyes the example of Our Savior. We will never ask “why” again – and we will know better how to embrace our sufferings and sorrows with an understanding of our need for penance. A book that was formative for one of our Sisters in her youth was Ven. Anne Catherine Emmerich’s The Dolorous Passion of Our Lord Jesus Christ. Sister tells us that her mother decided to read this book with her large family after supper during Lent one year, and it had a wonderful effect on the children, impressionable as they were at their varying ages, even the younger ones. The enemy of our soul and spiritual welfare wants nothing more than to ruin and degrade this holy time of Lent. Yes, Satan will mock its observance, through the world’s most obliging influence, and knowing well our wounded nature, he will temptus. Temptation is part and parcel of our life. Our Lord experienced it during His own forty-day fast in the desert. And so did His best friends throughout their lives. A recent publication sets forth the Christian paradigm for fighting this ongoing battle: Saints Who Battled Satan: Seventeen Holy Warriors Who Can Teach You How To Fight the Good Fight and Vanquish Your Ancient Enemy. The saints, through their own example, give valuable, wholesome advice for our own day-to-day struggle with Satan. Beginning with Eve, the first soul to be tempted by Satan, and moving through the centuries up to Padre Pio, we learn that God’s grace is sufficient for us and is infinitely stronger than this enemy. Humbly clinging to God is the only answer. With St. Paul, we will find that “strength is made perfect in weakness,” and that temptation is the necessary test of our fidelity, a trial that is even crucial to our spiritual progress. Referring once again to frequent requests for our newsletters to tell about aspects of Catholic practice, one kind gentleman who wrote us recently was humbly asking “for seniors who may not know or remember…” Truly, the last 50+ years have seen a tragic falling off of solid, age-old Catholic devotions. To remedy this, we would recommend again and again The Liturgical Year; you cannot find a better source for learning what the Catholic Church teaches, how she prays, the life she lives. 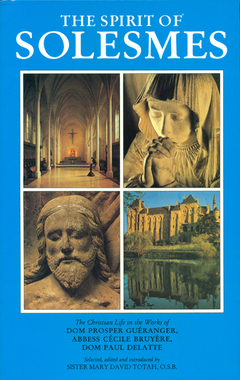 For all the major liturgical seasons, Guéranger gives three sections of introduction. So, for example, for this season, there is: “The History of Lent,” “The Mystery of Lent,” and “Practices of Lent”; and this last section introduces the life of prayer for the Christian. The entire work of The Liturgical Year can really be seen and used as a prayerbook. What a great resource this work of Abbot Guéranger is – with truly captivating information that proves how true it is that the way the Church believes is the way she prays – and the way she lives. We realize the 15-volume set is not inexpensive, but think of it as a worthy investment – as we did when we obtained our own set about 20 years ago. These volumes are never unused as we pass through each liturgical season, each year. The back section of most of the volumes contain most interesting accounts of the lives of the saints for the particular time of the year the volume comprises. So, for example, the Lent volume includes St. Patrick, St. Joseph, St. Benedict, etc. 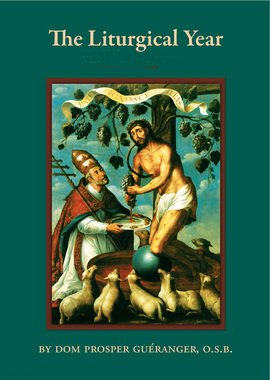 Lastly, The Spirit of Solesmes, is a wonderful book of Benedictine wisdom, offers abundant counsels for the understanding and the enduring of the Cross in our lives from day to day. We here in Carmel love this book for its practical wisdom and trustworthy guidance to the way of true sanctity. Shortly after Christmas, we had the joy of taking in a visitor. We took care of Titan, a beautiful German Shepherd, for about a month, with the consideration of perhaps getting a dog to guard and protect the Community and the monastery. He was a young dog of about three years, well-trained, smart and wonderful recreation for the Community. One or two of the Sisters had never had a dog, so it was a new experience. He very quickly got used to us – bells ringing for the Divine Office and Mass, processions from choir to the refectory, our habit hems brushing his face, and long periods of silence. With all the talk last fall that Colorado’s winter would be harsh with plenty of snow, we finally decided to get a snow blower. Shoveling snow is good exercise, but there is a limit, especially when the inches and drifts pile up! We got the blower just in time for our first storm, back in November, but we were very glad indeed to have it when a foot of snow fell at the beginning of this month, followed by winds produced drifts up to 3′ on some areas of the enclosure. 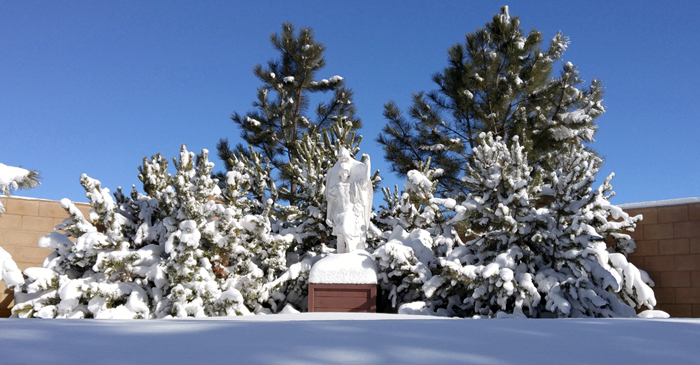 The storm started on the 1st of February and continued until late the next day, the Feast of the Purification of Our Lady and Presentation of Our Lord in the Temple – Candlemas Day. Forty days after Christmas, we celebrated this charming feast in silence and solitude, since all but four of the lay people who regularly come to our chapel for Mass were unable to travel that day. That included the organist, so we sang the beautiful chants for the Mass a capella in the nearly empty chapel. The priest who offered the High Mass for that day literally “preached to the choir” – tailoring his remarks for the priests and religious – encouraging us to imitate the sacrificial virtues of the Divine Infant and His holy Mother for our own purification and growth in holiness. 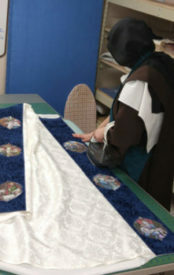 Just before Christmas, we had made a cope for this and other Marian feasts, and it was used for the first time on Candlemas Day for the candle ceremony preceding the Mass. 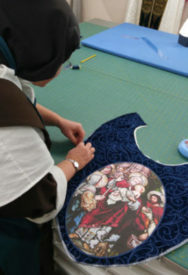 Another special vestment, the cope has embroidery with appliqués depicting the Seven Sorrows of the Holy Virgin Mary – one of which depicts the event commemorated on Candlemas Day – the prophecy of Simeon. according to the multitude of Thy tender mercies. we may be protected by the spirit of self-denial. may find its true worth in the sincerity of our souls.